Last year, Google showed off a new service, called Cloud Print that promised to link devices and printers across the Internet without needing to mess with complicated network sharing settings. Yesterday, they expanded Cloud Print to support printing from mobile web browsers on Android and iOS. Even though setting up and using Cloud Print is easy, there are still some steps that might not be clear, so keep reading to learn how to set it up yourself. To begin, you need a Windows computer connected to a printer. Google says Mac and Linux versions are coming soon, but for now, the home computer needs to be running Windows XP, Vista, or 7. You also need at least one printer set up on this computer. It doesn't matter what type of printer, or how they're connected, as long as they're there. Next, you must be using the Beta Chanel of Chrome. Chrome is Google's web browser, and it comes in three different versions: Stable, Beta, and Developer. The Stable channel is the one easily available at google.com/chrome, and is the most commonly used version. The Beta channel is for people who want to try newer features before they are finalized, but don't want to risk things breaking. The Developer channel is for web developers, and people (like me), who want to always be using the latest and greatest, regardless of stability. Cloud Print is still a beta product, meaning it hasn't been finalized for use in the Stable channel, so you'll need to bump up to the Beta or Developer channel to use it. Switching channels is easy and you can do it by simply clicking these links: Beta channel, Developer channel. Once you are running the Beta or Developer channel, you can set up Cloud Print by clicking the Wrench icon in the top right, then Options. From the options window, click Under the Hood, and look for Google Cloud Print. Click Enable and follow the steps for turning Cloud Print on. That's it! Cloud Print is now set up and running on your home computer. In order to print back to it, you need to have a smartphone or a Chrome OS device (like the Cr-48). I'm sure Google will update things in the future to allow standard PC and Mac laptops to print back to the home printer, for example, but for now that's not supported. On a Chrome OS device, you simply click the Wrench, then Print and it automatically pulls up your Cloud Print printers. On a smartphone, things are a tiny bit more complicated. For now, Cloud Print only works on Android and iOS devices that have HTML5 browsers...and it's only done through the browser. You can't print emails from the native Android Gmail app, for example. That's coming, of course, but for now, you have to sign into Gmail or Google Docs from the phone's browser. Then you simply hit the arrow drop down, and tap Print. From there, you get a menu to select which printer you want to use, and that's it. The document is sent back to your home computer and printed. The only downside is that your home computer must be running and connected to the Internet. Though, it's worth noting that Chrome does not need to actually be running on your home computer, since the Cloud Print service runs independent of the browser. 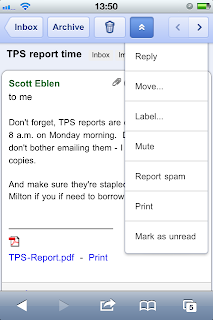 Cloud Print works extremely well and is a great addition to Google's mobile offerings. I'm looking forward to seeing it come to the native Android and iOS apps, but until then, this is an awesome first step for those times when you need to print from your phone. How about you? 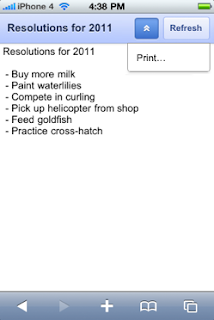 Do you see yourself using Cloud Print now that it's available on mobile?